The world’s largest refinery and petrochemical complex, operated by Reliance Industries Limited (RIL) in Jamnagar, India, achieved a historic first with execution support from FieldCore. It became the first complex to successfully begin using synthesis gas (syngas) to operate three of its 15 existing gas turbines. While GE builds gas turbines designed to burn syngas, this milestone is significant because it marks the world’s first conversion of an existing gas turbine to use this fuel. This fuel type is created from a byproduct of RIL’s manufacturing process. Under the US$150-million agreement signed some time ago with RIL, GE had contracted to retrofit 6 x 9E and 9 x 6B dual-fuel units as well as install three new 9E turbines originally designed to run on syngas. Bhalani Jaman, Vice President, Jamnagar Complex Shift Manager for RIL, in an earlier email sent to senior members of staff this quarter, described the syngas trial firing as “successful and flawless in co-firing mode.” He wrote that syngas use in power generation of GTs had been a dream goal for the RIL J3 project and that it had been realized that day. “This is a proud moment for all at RIL including the GE design and FieldCore support team. The team thanks one and all for providing guidance, support and help in achieving this dream goal.” he added. This ground-breaking achievement is the result of exceptional dedication and efforts by multiple cross-functional teams (ranging from FieldCore field staff, GE Engineering, project managers from South Asia, and GE Power Services and Gas Product Services). Syngas (short for synthesis gas) is a fuel gas mixture consisting primarily of hydrogen, carbon monoxide, and often carbon dioxide. It can also be used as an intermediate resource to produce ammonia, methanol and other fuels. Syngas is a product of gasification, and as it is very combustible, its principal application is power generation. This gas can be derived from different sources, and in the case of RIL, the refinery process delivers, among other things, a waste byproduct known as petroleum coke (petcoke). RIL used to sell petcoke on the open market for some time as it gave good returns. Now with liquefied natural gas (LNG) prices soaring and availability of natural gas a challenge, syngas is the best option available for RIL Jamnagar Megasite, according to a RIL spokesperson. Thus, RIL installed a gasifier which turns petcoke into syngas, and hence a need to convert its existing turbines so they could run on this type of gas. The syngas conversion project of GE helped RIL to eliminate high cost LNG imports forever, the spokesperson added. There are some syngas-firing sites in existence in the world, but those turbines were originally designed for this purpose. 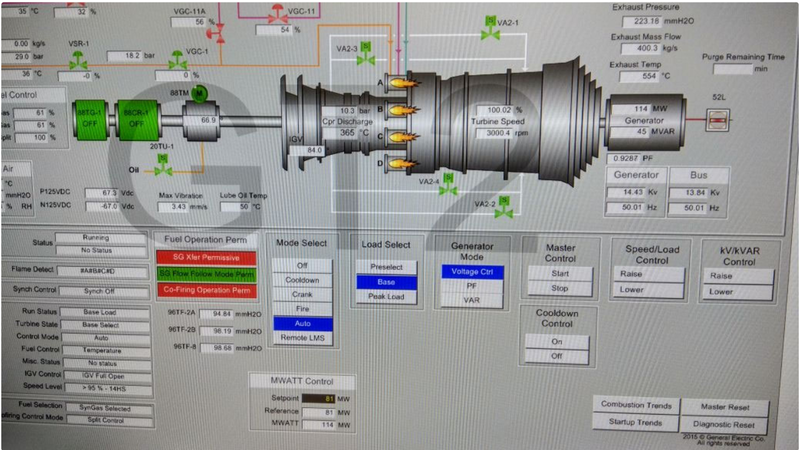 In fact, in 2010, GE had shipped its first integrated gasification combined-cycle (IGCC) syngas turbines (GE 7F) to Duke Energy’s power plant in Edwardsport, Indiana, USA. Here, IGCC technology converts coal to syngas. As a pioneer in the development of IGCC technology, GE has already provided equipment for several other milestone IGCC projects. In the case of RIL, a retrofit – the first of its kind – was essential to enable conversion of the existing dual-fuel turbines so the company could benefit from the syngas it produced onsite. Not only did this demand a great deal of engineering and design work, but also called for collaboration with sites where originally-designed GE syngas turbines were in operation, as well as numerous meetings, modifications to ventilation, sensors and monitoring systems, and installation of additional hazgas sensors, including carbon monoxide monitors. Existing natural gas skids had to be replaced with newly designed skids that could fit perfectly in place of the previous ones. Brand-new nitrogen compression skids, liquid fuel recirculation skids as well as syngas supply skids had to be designed from scratch, then manufactured and installed. A great deal of data was collected from GE sites that were running on syngas, and this information had to be analyzed and adjusted for the RIL retrofit. Some team members along with the customer even visited a plant in China to collect information and trends on firing sequences. According to Amir Hafzalla, FieldCore’s RGM for Africa, India and Middle East, the project’s scope and positive result, suggest real evidence of FieldCore’s commitment to deliver World-Class Execution in line with its four guiding principles – execution as a priority; innovative thinking; simple, nimble, fast; and better together. The 16-strong FieldCore site team, under site lead John Babu and control lead Avinash Gajjar, spent long hours pulling out all the stops to make the retrofit a reality. They worked closely with the GE Engineering team of around 30 people from Design Engineering, Accessories and Requisition Engineering, Controls Engineering and Product Services teams who came together – each with a pivotal role to play, and with specific responsibilities ranging from design, commissioning through to software and final execution. Parag Lamba, FieldCore Outage Manager in India – who has been associated with this project since the start, said there had been many challenges for GE Engineering and the FieldCore services team, but through commitment and support of everyone involved, a groundbreaking feat was inevitable. “When the project began, everyone was GE Power Services, but by completion some of us were part of FieldCore. The impressive thing to me is how, despite being many individuals making up different teams, we all had a common sense of purpose – making good on our undertaking to the client,” Parag said. 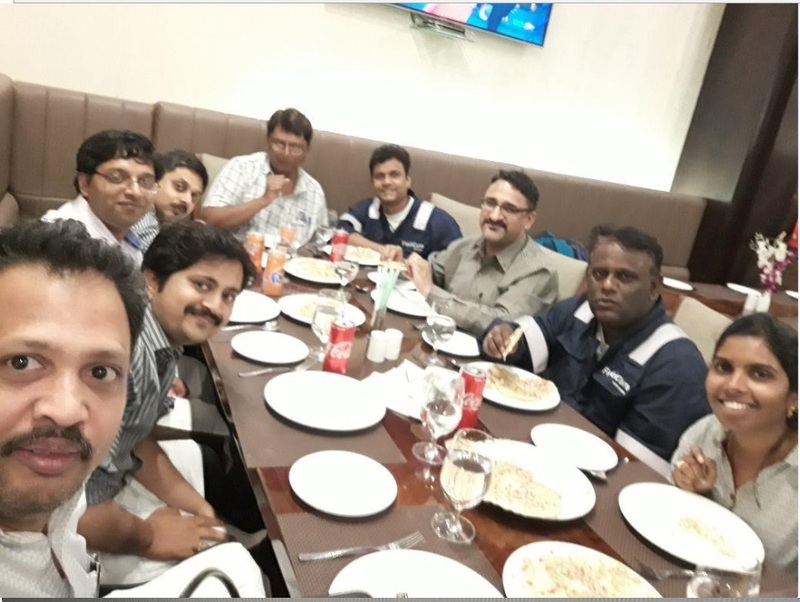 Milestone dinner: Some of the FieldCore team members having a celebratory dinner after the first GT reached baseload on syngas.